Dry chicken properly. Mix chicken with salt and pepper. Then put in egg white. 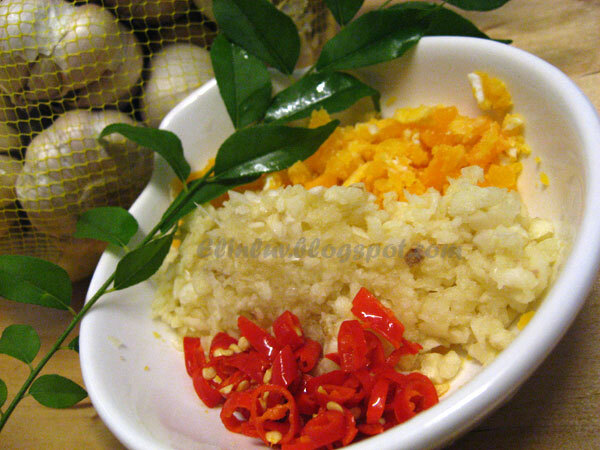 Marinate for half an hour, at least. 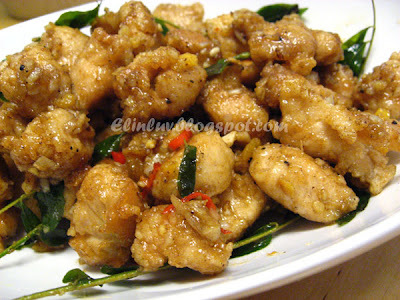 Coat whole pieces of chicken with tapioca starch. Dust off extra starch. Deep fry chicken pieces until golden and crispy. In wok, on medium heat , put in oil, garlic and butter. 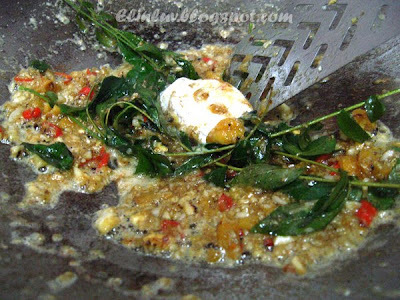 When butter has melted, put in sliced chilli and curry leaves. When they are fragrant, put in mashed egg yolks, with spatula, try to flatten the yolks into the oil and cook until it look bubbly and fragrant (won’t take long). Turn heat to low and put in milk, salt and sugar. Turn heat to high and and cook until very bubbly. Put in chicken and toss until well coated. Elin, I can almost smell it here! Then this should be one of your CNY eve dinner menu, right! Thanks for sharing. & have a wonderful evening! Looks like restaurant's - so professional. I wouldn't bother to pre-fry my chicken pieces - not healthy and if not eaten immediately, not so nice. I too bookmarked this to try out but have yet to get it done. The dish look so mouthwatering. Great, I think this sympathy pregnancy thing is spreading b/c now I'm craving salted eggs. This looks perfect to me! Definitely like it came out of a restaurant kitchen! I love this dish elin. I saw the recipe from wendy's blog as well. Yours look absolutely yummylicious too. =)...can't wait to try this recipe out myself. yum yum, mouthwatering..also can finish 2 bowls of rice with this. didnt know that we can replace the evaporated milk with non diary cream. Claire...I have not tried it without deep frying them first and more so with the whites of the salted egg :p must be very saltish then. yea...cook more the next time. Arthur....haha thanks for your kind words...still not to standard yet...have to cook more often then only it will be perfect , then only can start a restaurant chain LOL! Leny...oh you must this out :) It is good ! 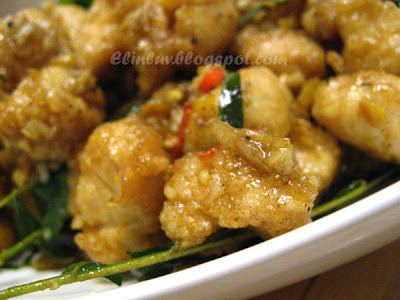 The chicken sounds so good with the salted egg yolk mixture, I would sure love to try this specialty! 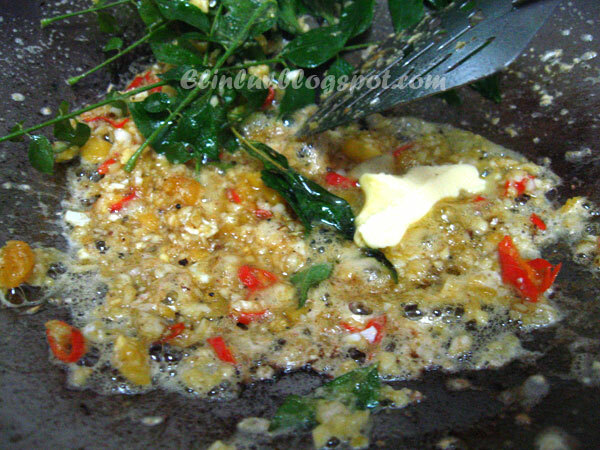 When I fry the egg yolks hoh, it looks like when one fries dried shrimp, the mixture will bubble up like fresh cola from the can. When I saw chefs cooking on TV, it was the same too. Maybe our heat is higher. I'm not sure. I think you version with cream will be nicer, but the one I saw on TV is evap milk, hehehe, so I just followed suit lor. Oh my! This looks absoverylutely delicious! I love salted egg yolk everything! Have to try it this way soon. Thanks! 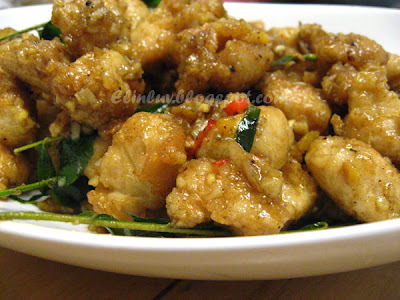 how much is the calorie for one portion of salted egg chicken?